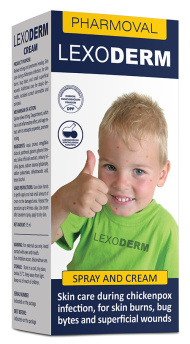 Lexoderm cream and spray - skin care for chickenpox. Spray: Spray has an antispetic and soothing effect. Skin care during chickenpox infection, for skin burns, bug bytes and small superficial wounds. Additional care for atopic dermatitis, localized scratch dermatitis and psoryasis. Cream: Relives itching and promotes healing. Skin care during chickenpox infection, for skin burns, bug bytes and small superficial wounds. Additional care for atopic dermatitis, localized scratch dermatitis and psoryasis. Spray: Sage extract (Salvia officinalis) has an antiseptic effect and oat extract (Avena sativa) has soothing effect on damaged skin. Cream: Glycine relives itching. Dexpanthenol which has an anti-inflammatory effect, and sage extract, with its antiseptic properties, promote healing. Spray: Disperse the solution to the damaged skin area. Use clean hands to gently rub it on the skin or use cotton pad. Repeat the procedure up to 4 times a day. Use the spray before applying Lexoderm cream. Wait until completely dry. Cream: Use clean hands to gently apply and rub small amount of cream to the damaged area. Repeat the procedure up to 4 times a day. Use cream after Lexoderm spray, apply to dry skin. For external use only. Avoid contact with eyes and mouth. If an irritation occurs, disconutinue the use. Store in a cool, dry place, below 25 °C. Keep away from light. Keep out of reach of children.